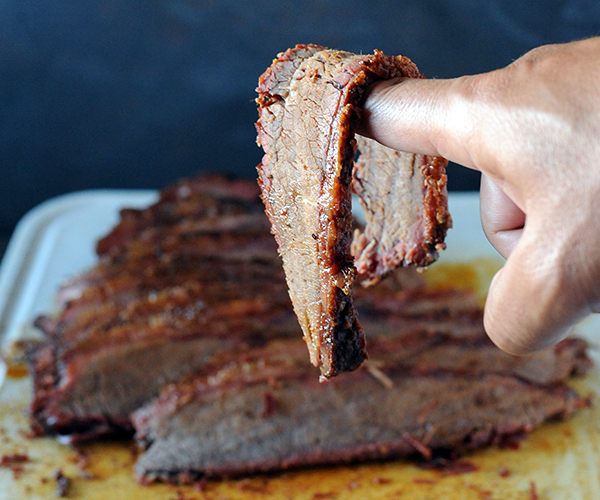 The point muscle is the thicker end of the brisket and people often refer to it as the fatty end because it has a wonderful fat content throughout. The flat muscle is the thinner end of the brisket and people refer to it as the lean end because it has less fat content throughout. A whole brisket, or as some people refer to as the, “packer cut,” is both the point and flat together as one. When smoking brisket I always say, “go big or go home,” and get the packer cut. For those smoking a brisket for the first time, it can be a challenge to get great results when smoking just the flat end because of its minimal fat content. 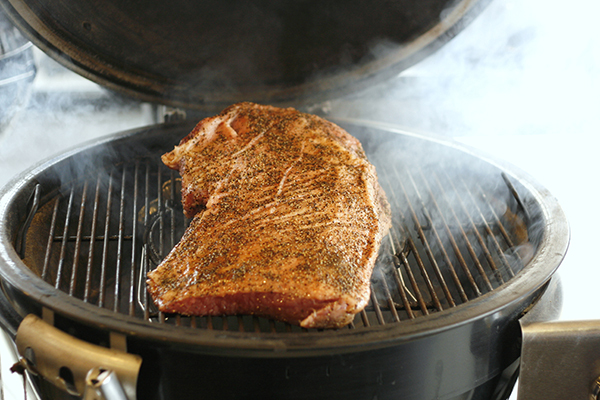 When smoking the packer cut the fat content throughout point renders down and helps keep the flat end moist and tender. It’s important to trim a good amount of the fat off of the fat cap on the top of the brisket, but don’t trim it all off. Leave a little less than 1/4th of an inch of fat on the top side of the brisket. During the cooking process this fat will render down and develop a tasty bark, that is absolutely delicious. When you get a good cut of beef all it really needs to bring out its natural flavor is some salt and pepper. 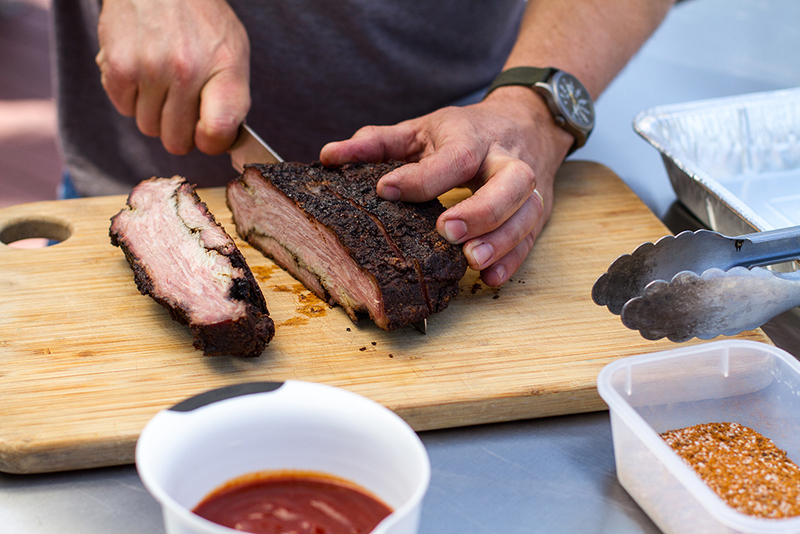 Don’t be afraid to be generous and make sure to cover both sides and corners of the brisket. 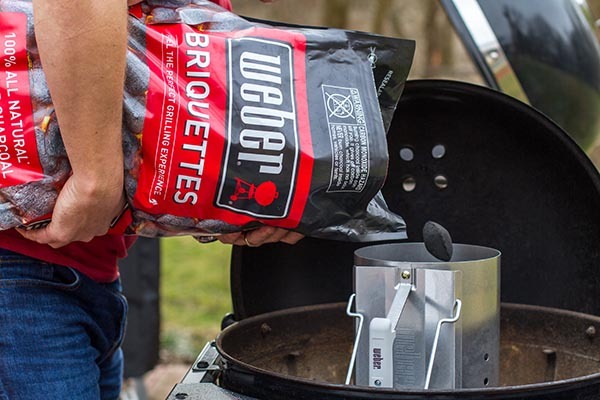 Weber Briquettes is the best fuel source to use when smoking anything because it burns consistently over a long period of time and is an all natural briquette, which means no added fillers or chemicals. When it comes to wood, you have a variety of options. One of my favorites is a blend of both hickory and apple. When adding wood just remember, less is more! If you add too much wood, it can leave your brisket tasting bitter and over-smoked. Weber’s recommended smoking range is 200-250 degrees F. I prefer to stay in the range of 200-225 degrees when smoking a brisket. When it comes to time, don't rush! Make sure you allow yourself enough time to do it right. If you’re trying to serve lunch at 12pm, I’d recommend putting it on the night before and smoking throughout the night. If you’re trying to serve dinner at 7pm, make sure you get it on early as early as possible in the morning. Weber’s iGrill is a great device for tracking the internal temperature of the brisket and the ambient temperature of air at the grate. Cook your brisket until it reaches an internal temperature of 200 degrees F. You will notice that around 160-165 degrees the internal temperature of the brisket will stall. Don’t worry, it’s completely normal. If you want to push through the temperature stall, wrap the brisket in butcher paper. This will help the temperature rise up to 200 degrees, while maintaining the exterior bark. Once the internal temp of the brisket is at 200 degrees in the center, remove it from the grill and let rest in a dry cooler for 1-2 hours. This step is very important and will contribute to the briskets tenderness. Like trees, all beef has a grain. It’s important to slice in the opposite direction of the grain so the meat pulls apart easily. The point and the flat have grains that move in different directions. As you’re slicing through the flat and you start to approach the point be sure to rotate the muscle to ensure you’re still cutting against the grain. The thinner the slice the more tender it will be. A packer cut brisket is great to smoke, but could leave you with some leftovers. A couple of my favorite ways to repurpose brisket are: brisket breakfast hash, brisket nachos, brisket chili, and a brisket panini. For more information about brisket click here, here and here!